CARA is part of the TD Lands Community Consultation Committee (TLC) which is helping to develop a vision to revitalize Mill Street and determine the best possible use of the TD lands. The TLC is working with SMALL, the not for profit arm of ERA Architects to help conduct community consultation and develop a vision. From left, Clearview Council candidates include for mayor Chris Vanderkruys, Doug Measures; for Ward 5, Anthony Sist, Thom Paterson; for Ward 2, Donna Baylis, Doug McKechnie at the all candidates meeting, October 14, 2018 hosted by CARA. Photo courtesy Creemore Echo. CARA hosted and moderated an all candidates meeting for Mayor and Wards 2 (Dunedin, Glen Huron, Duntroon) and Ward 5 (Creemore, Avening). Issues included economic development, the environment, seniors housing, transit, customer service from Township staff, the development at Cashtown Corners and the role of agencies such as the Nottawasaga Valley Conservation Authority and the Niagara Escarpment Commission. The Echo, February 23, 2018, "Developer's changes seen as reasonable"
Through its Liaison Committee, CARA has been working with Alliance to review modifications to its plan. These affect the phasing of the development and minor modifications to the house designs. The Echo, November 7, 2017, "Hey TD, Please respect your stated values"
CARA has appealed to TD urging it to reconsider closing the Creemore branch which has been here more than a century. The Echo, April 7, 2017, "CARA gives the gift of music"
CARA made a donation to the Collingwood High School to enable a student, Destiny Scott, to buy a guitar and pursue her song-writing and singing talents. The Echo, September 2, 2016, "The battle between agricultural and industrial land uses"
CARA opposed the Zoning By-law Amendment requested by Steer Enterprises to permit an industrial truck repair facility to be built on prime agricultural land. The Echo, June 30, 2016, "ATVs should not be encouraged on local roads"
CARA objected to the proposal by the Central Ontario ATV Club to allow ATVs to travel in Clearview on local roads. 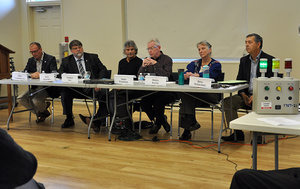 The Echo, October 24, 2014, "CARA presses candidates on special interest topics"
CARA sponsored and moderated an All-Candidates Question and Answer meeting for candidates in for election in Ward 5 (Creemore), Ward 2 (Dunedin/Glen Huron), and as Mayor and Deputy Mayor on October 19, 2014. There was a specific agenda, pointed questions and illuminating answers. CARA periodically contributes articles to the Echo on current issues and updates members in the “Creemore Corner” section of the paper.